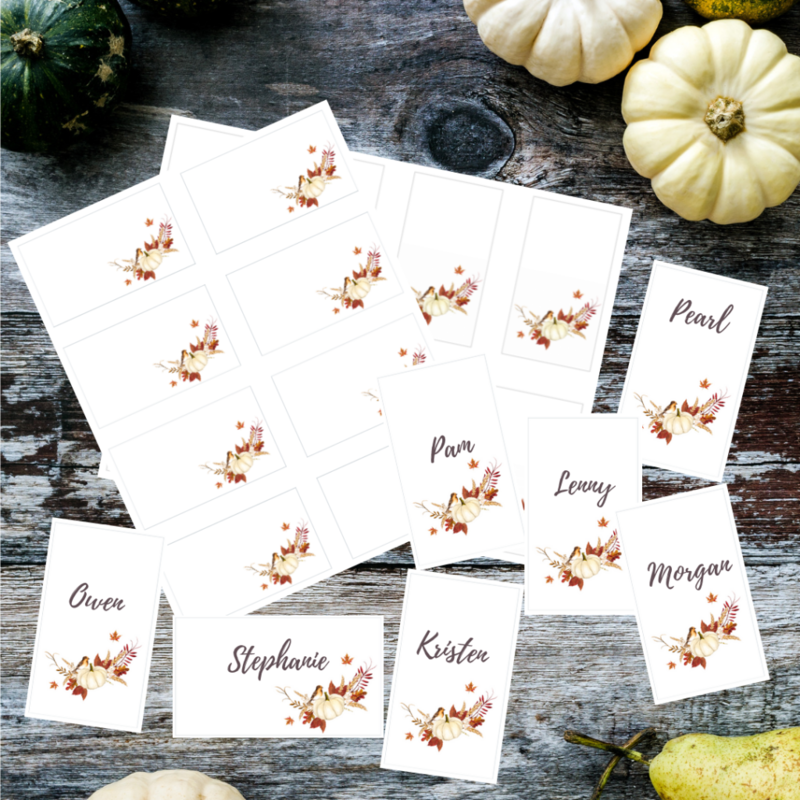 These free fall printable place cards will add a festive touch to your tablescape for Thanksgiving or anytime during the fall season or when you just want to add an extra touch of fall to your home decor. Do you decorate your table for Thanksgiving dinner? I have only a couple of times. We have such a large family that table decorations just seem impractical. I mean, if I have a bunch of pumpkins and fall foliage adorning the center of my table, where will I put all the food? Honestly, we have such a large family and a small house that we don’t usually all fit around the dining table. So when holidays come, you’ll find our family spread throughout the house. I try to provide a place in our family room in the basement and set up two long tables so we can all dine together. But still, it never fails that we have people feasting all over the house. How do people do it? I just can’t figure out how to get my family to dine in a more refined fashion. I guess we’re just to casual, even during the holidays. But, you know what? I love the conversation and laughter that fills my home much more than I care about how the table is decorated. Some day when my children appreciate more finer things, maybe we’ll have a beautifully adorned dining experience. In the meantime, I’m just grateful that home is still “home” to our growing family. In case you don’t know, we have seven children. But our family story doesn’t end there because our children have children and spouses and girlfriends and boyfriends. As of today, there are 21 in our immediate family. 21! Now that is crazy! In a good way, kind of crazy! 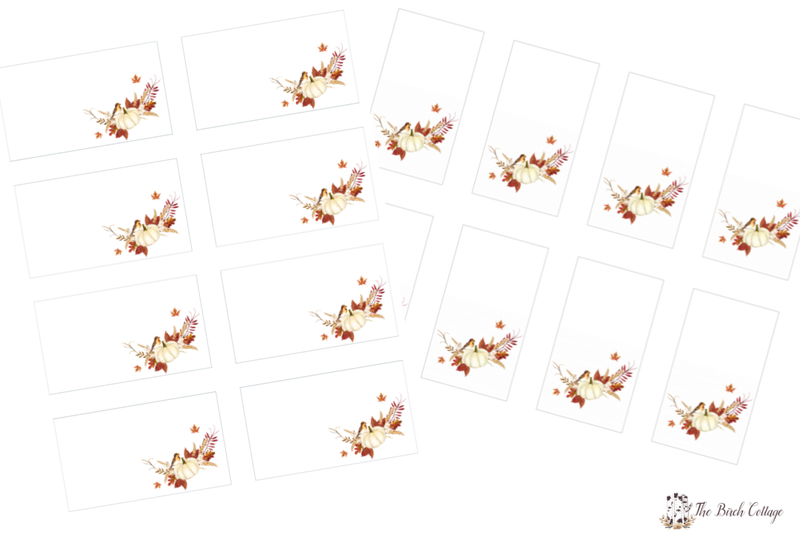 Anyway, I thought the very least I could do this year for Thanksgiving was to try to get our family to dine together and I thought that maybe having some place cards would help. We shall see! 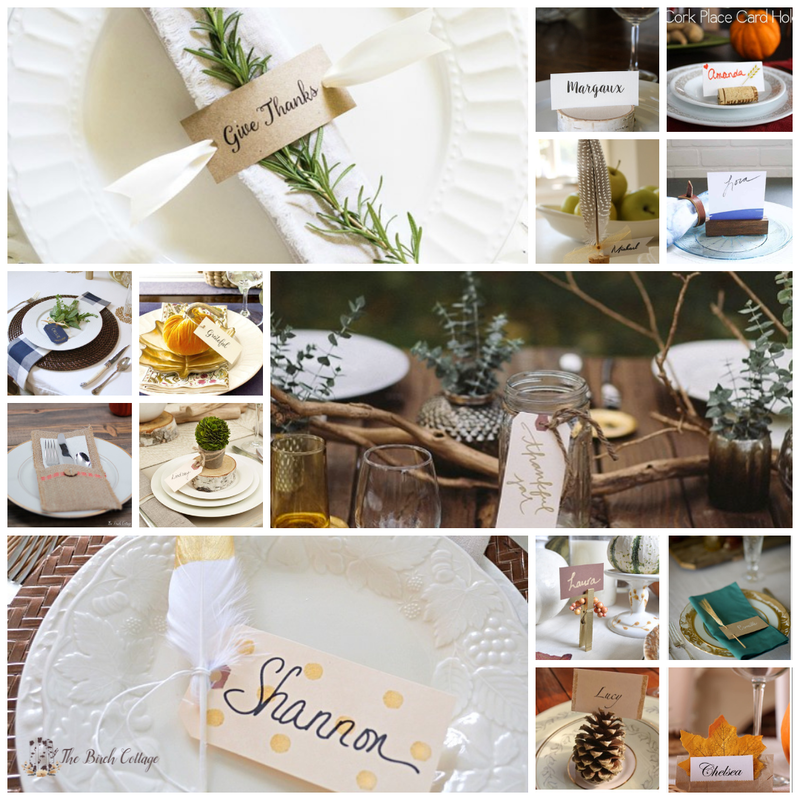 Of course, you could simply print out the place cards, write in your guests names and lay the place cards at each place setting. That’s certainly simple enough, right? 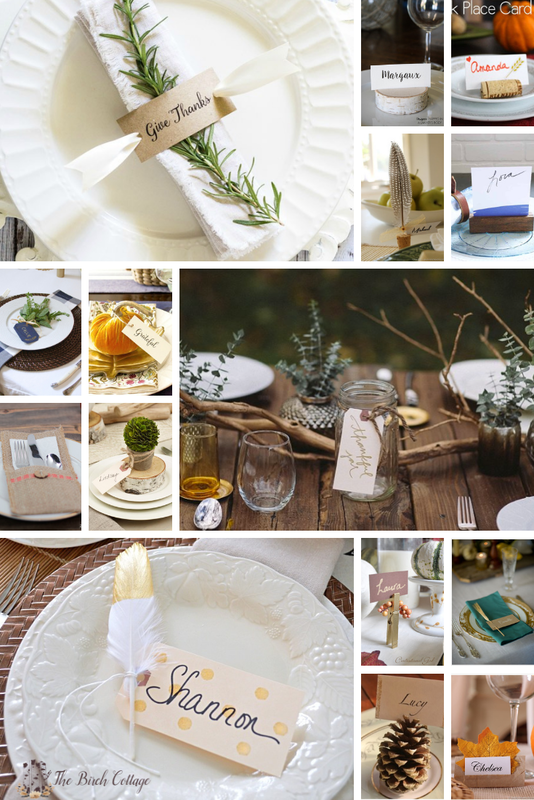 But, with just a little more effort, you can make your Thanksgiving tablescape a little merrier. 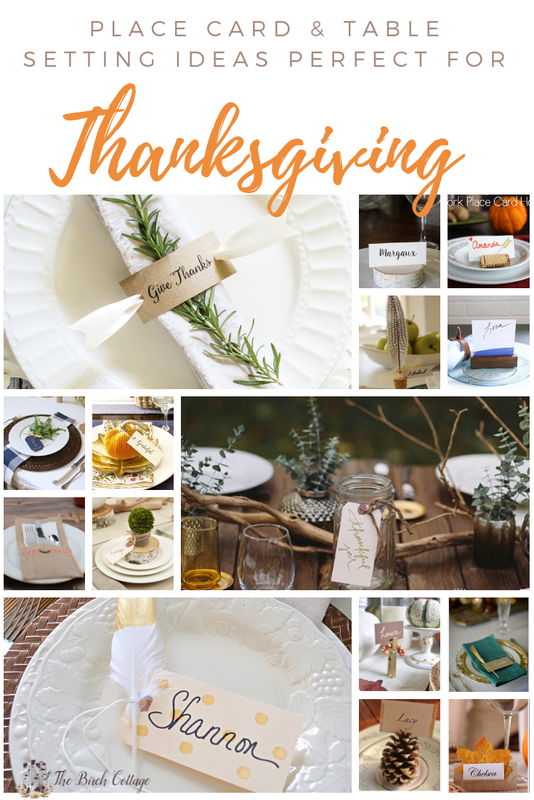 Here are some ideas I found that I thought would make for simple, yet festive touches to your Thanksgiving tablescape. Actually, these ideas can easily be applied towards other holidays and gatherings as well. Let’s take a look and, hopefully, find some inspiration, shall we? Place a small pumpkin at each place setting. Punch a hole in the place card and attach to the stem of the pumpkin. See how here. Make napkin rings out of the place cards by punching a hole in each end, threading ribbon through the holes and wrap around your napkins. See how here. Combine with paper lunch bags to make a DIY place card tent. See how here. Attach to the front of burlap utensil holders. See how here. Make gold clothespin place card holders. See how here. Make use of your wine cork stash and purchased feathers with easy to make wine cork and feathers place card holders. See how here. Make wood slice place card holders. See how here. Attach a wheat stalk to the place card. See how here. An even easier idea for making a place card holder out of wine cork. See how here. Make a place card holder out of a pine cone for a rustic look. See how here. Attach to a bouquet of herbs. See how here. Attach to a gold dipped feather. See how here. Attach with twine to a tiny potted topiary plant. See here for inspiration. Place a votive candle in a mason jar and attach place card with twine. See here for inspiration. Make a wooden place card holder. See how here. These are the place cards that I designed using Avery 8869 Printable Business Cards. 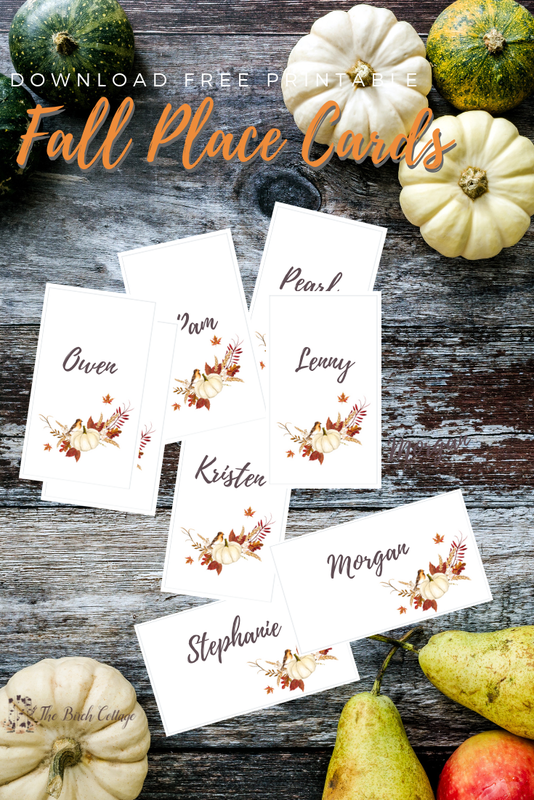 These business cards are just the perfect size for these fall place cards. Plus, the cards print and separate so easily! You can purchase them through Amazon using the below link or from your favorite office supply store. I also designed these both in a horizontal design and a vertical design. By the way, we love and highly recommend Amazon Prime. If you’re wondering what all the hype is about, you can read about some of my favorite Prime Perks here. 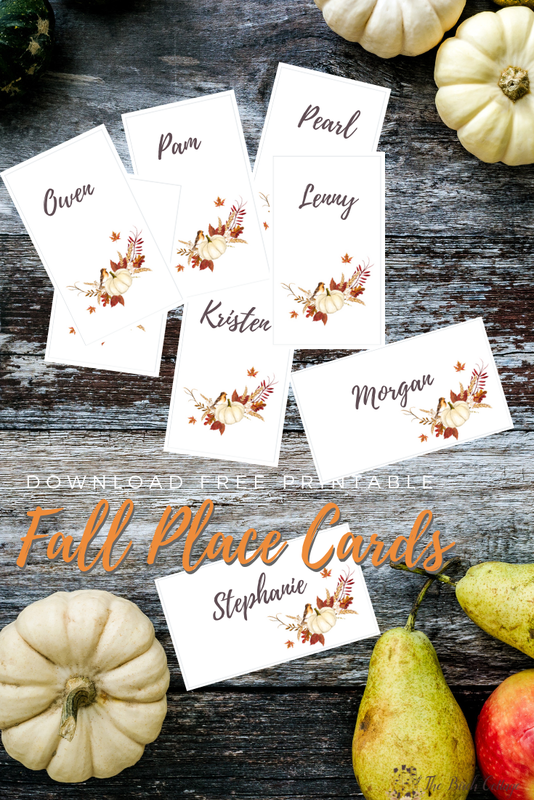 Once you subscribe, you’ll receive a confirmation email from The Birch Cottage with a link to the Subscribers Resource Library where you’ll have access to these free fall printable place cards and so much more! Plus, you’ll find the link to the Library at the bottom of every email message you receive from The Birch Cottage. Your access is always just a few clicks away. I do hope you’ll subscribe! When you celebrate Thanksgiving, what does that celebration look like in your home? How do you get your entire family to gather around the table and dine together? Do you have a large family? Do you have a large table that accommodates your entire family? Do you decorate your table for Thanksgiving? Christmas? Regularly? Do you have family traditions for Thanksgiving? Favorite Thanksgiving foods? What does Thanksgiving dinner look like in your home? I’d love to hear about it!